New York Yankees cake birthday cakes New York City, NY. Nothing says I love New York like an official New York Yankees cake. This single tiered round birthday cake is designed to resemble an official Yankees baseball with the official NY logo in the center of the ball. This cake is a true symbol of New York City. This cake is simple but detailed at the same time. Just take a look at the detail of the red baseball stitching on this New York Yankees cake baseball. We take pride in every cake we bake and we hope you love our work. Our customers definitely loved this cake. For this custom designed New York Yankees cake we were asked to make a very simple cake filled with very special cake fillings. The inside of this Yankees cake is half chocolate and half vanilla cake. The fillings are half Oreo buttercream and half chocolate raspberry Ganach. The New York Yankees cake is covered in a sweet vanilla fondant and the accented New York Yankees logo is a fondant white chocolate mix. The baseball cakes stitching mentioned earlier is made with a vanilla buttercream that was died red for authenticity. Our clients just loved the way it came out. Please remember that this New York Yankees cake is just a small taste of what we can create. 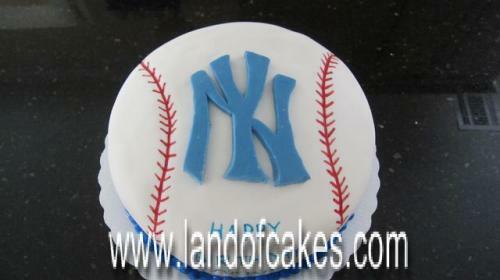 If you like this cake we can also make a Yankees stadium cake. Order your next birthday cake from Land of Cakes New York.